Learn how to make cauliflower rice that actually tastes good (just as good as real rice!). This is the best way to cook tasty cauliflower rice from frozen or fresh. Let’s talk about making cauliflower rice that tastes GOOD. Sure we can add a ton of spices and other flavors and make it delicious. But what if you’re looking for a substitute for plain white rice? Most plain cauliflower rice ends up tasting pretty blah. The good news is, it just takes a few simple ingredients you probably already have in your pantry and a change in cooking technique to get it tasting delicious! Where to buy cauliflower rice? You can buy frozen cauliflower rice in the freezer section of most grocery stores these days. My favorite brands are Whole Foods 365 Cauliflower Rice, Trader Joe’s Cauliflower Rice, and Green Giant Cauliflower Rice (found at many chain grocery stores as well as big box stores like Walmart and Target). Many grocery stores have also started carrying cauliflower crumbles in the produce section, near the bagged salad and packaged vegetables. I don’t usually buy these, because I don’t like having to worry about produce going bad in the fridge. I prefer to stay stocked up on frozen cauliflower rice. Is cauliflower rice raw or cooked? Store bought cauliflower rice, whether it’s frozen or refrigerated, is raw. How many calories are in cauliflower rice? Plain Green Giant Riced Cauliflower has 20 calories per cup. 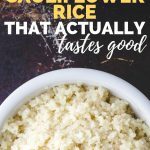 The recipe in this post for Easy Cauliflower Rice that tastes good has 73.5 calories per one cup serving. Should you buy frozen cauliflower rice? You never have to worry about it going bad in the refrigerator before you get around to using it. You save time by not having to wash, trim, and grate a head of cauliflower. While premade frozen is more expensive, there’s less waste. And for me, the time savings is worth it! Want to make your own fresh cauliflower rice without a food processor? You could use a Kitchen Aid stand mixer or Vitamix (more on that below) but if you don’t have any of those available, an inexpensive box grater with large holes like this one is the next best choice. Simply wash and trim your head of cauliflower, and then grate the cauliflower into rice-sized pieces using the large holes. If you already have a Kitchen Aid stand mixer, you can use their slicing and shredding attachment to grate the fresh cauliflower. Just wash and trim the head of cauliflower and roughly chop it into 2″-3″ pieces (use those stems too!). Then feed the cauliflower pieces through the large hole grating drum. Making fresh cauliflower rice in a Vitamix blender is super easy. First, wash and trim the head of cauliflower, and roughly chop it into 2″-3″ pieces. Be sure to use the stems too! Working in batches, fill the Vitamix to around half full with the cauliflower pieces and then add enough filtered water to cover the cauliflower. Pulse the cauliflower and water in the Vitamix until the pieces are rice-sized. Drain the cauliflower rice in a colander with small holes. What’s the best way to cook cauliflower rice? As you’ll see in my recipe for tasty cauliflower rice below, I prefer to cook it similarly to regular white rice. I use chicken broth instead of water for extra flavor and nutrients. Can you cook cauliflower rice in the microwave? You can definitely cook cauliflower rice in the microwave. 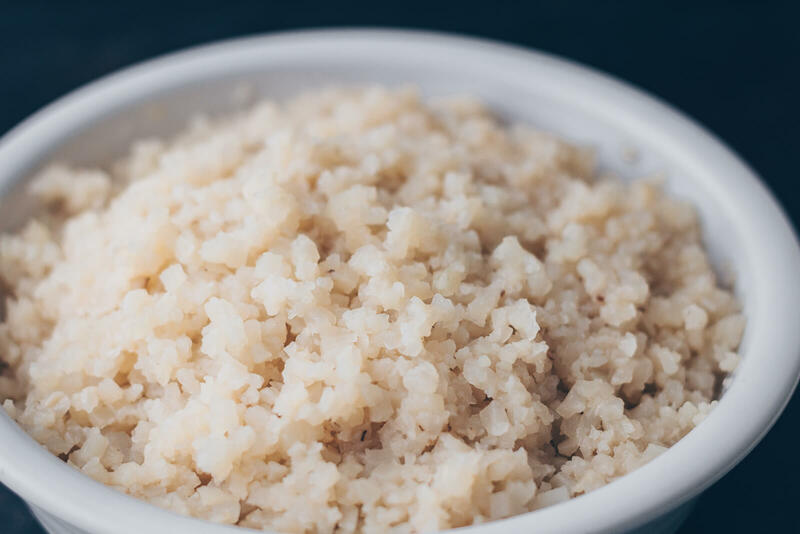 Put fresh or frozen cauliflower rice in a large, glass, microwave-safe large bowl and add 2-4 tablespoons of filtered water or chicken bone broth. Cover the bowl (I use a large microwave-safe plate) and microwave on high for around 3 minutes. Continue microwaving in 1-minute increments until it reaches your desired doneness, stirring each time. Then season with salt to taste. Ready to move beyond the basics and wondering what spices to put on cauliflower rice? One of my favorite variations is cilantro lime cauliflower rice. 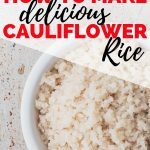 I start with the basic cauliflower rice recipe included in this post, using 24 oz of riced cauliflower. To the finished rice, I add the zest and juice of half a lime and 1 tablespoon of chopped cilantro. So yummy, whether you pair it with a Mexican dish or even a Southeast Asian dish! In a large saute pan that has a lid, heat the avocado oil over high heat until shimmering. Add the cauliflower rice, using a large metal spoon to break up any large chunks if using frozen cauliflower. Season with salt and saute for 5 minutes. Add the chicken broth and bring to a boil. Turn the heat down to a simmer and cover the pan. Cook for 10-15 minutes, until no liquid remains and the cauliflower rice is your desired doneness (fresh cauliflower may cook faster than frozen). 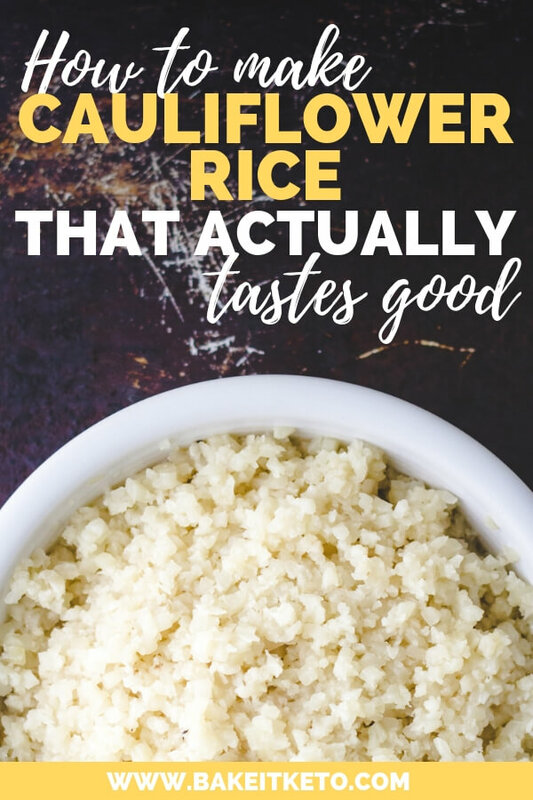 WANT TO SAVE EASY CAULIFLOWER RICE THAT TASTES GOOD FOR LATER? CLICK HERE TO SAVE THIS RECIPE TO YOUR FAVORITE KETO PINTEREST BOARD!